Cut the deck, literally, with poker dice! Each set of 5 poker dice mimics a real poker hand but fits right in your pocket and plays in the smallest of spaces. Combining the fun, excitement, skill, and luck of poker and Yahtzee, a single game of poker dice is quick and addictive. Every poker die is an aged shade of ivory, features four colorful shades of paint, and has six engraved faces: 9, 10, Jack, Queen, King, and Ace. 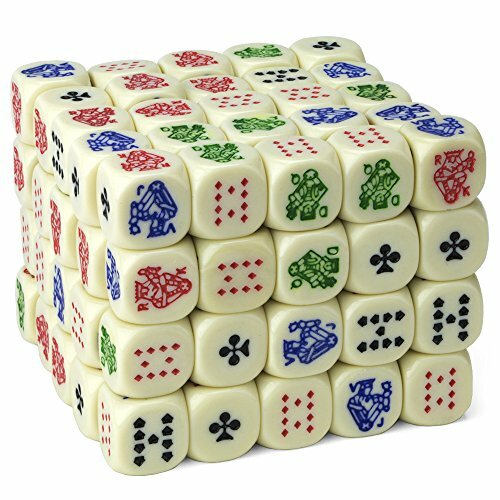 Poker dice are your standard 16mm dice with backgammon-style rounded corners for the most random and fair rolls in small spaces. The first player rolls 5 dice to be dealt their "hand." From here, the player may "discard" and reroll all unwanted hand dice up to two times. After the third roll, that player's hand is decided, and the next player rolls their hand. The best hand when all players are finished is the winner. To complete the experience, try adding in poker chips! You can even play Hold'em Poker Dice.